Discussion in 'Announcements' started by Sovereign, Sep 6, 2018. The event starts on Wednesday, 12th of September, so you will soon be able to jump right into it . Watch our video where our game designers explain this year's Fall Event . So this year it is all about baking! As mentioned in the video, in order to bake you need ingredients. The most reliable way to get them is completing the Fall quests (although you will find some also in the incidents in and around the city, as well as in the Daily Challenges). You will get 54 quests that you can complete right away (as two parallel questlines - the second one will show up after completing the first four quests). Once you've completed all of them, you will be getting one quest per day, for the remainder of the event. You will probably have a few of them stacked when you get to them, as they start stacking up starting on day one. The more stars you collect, the higher you get in the leagues! There are 5 leagues, and the requirements for each league is determined by stars collected by all players in your game world. For example, the top 1% of players who have collected the most stars are placed in the top league, while the bottom 50% of players who collected the least stars will appear in the lowest league. If you stay active during the event, you are likely to climb up the league system, while a lower level of activity will result in falling down in the league. As the event progresses, the number of stars required for each league will also change as players collect more and more stars, so make sure to keep an eye on the amount of stars you need to reach the next league! 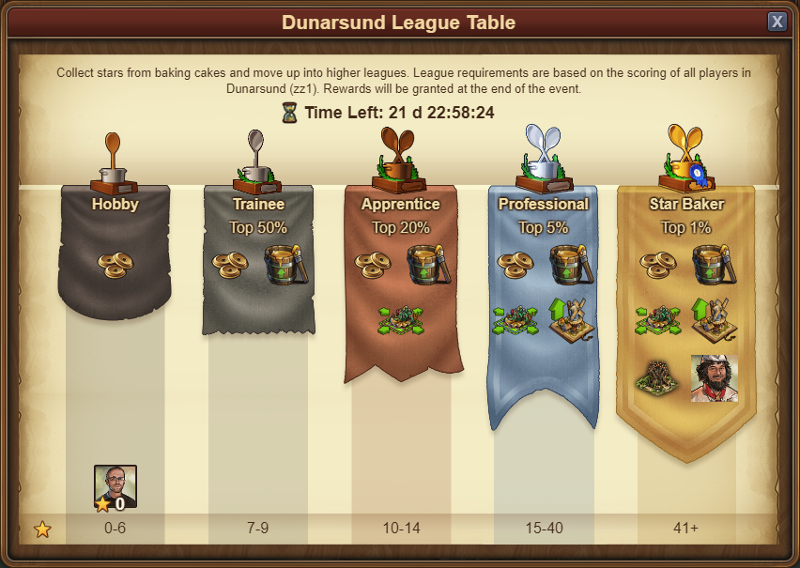 At the end of the event, everyone will receive rewards according to the league they are in. As mentioned in the video, the event comes with some brand new desirable rewards! Provides happiness and a defense boost. The output does not depend on motivation. Produces coins. Additionally, produces medals when motivated. 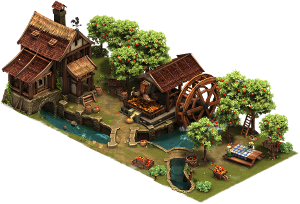 The Mill of Fall is a special upgradable building. Once you have gotten it to the level 1, you will then have a chance to upgrade it up to five times. 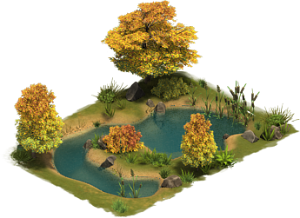 Once you reach level 6, you will be able to upgrade it one more time, but at this point you will need to make a choice between three options: Aqueous, Sunflower or Colorful Mill of Fall. Each of them provides different output, so it is up to you to make the choice! 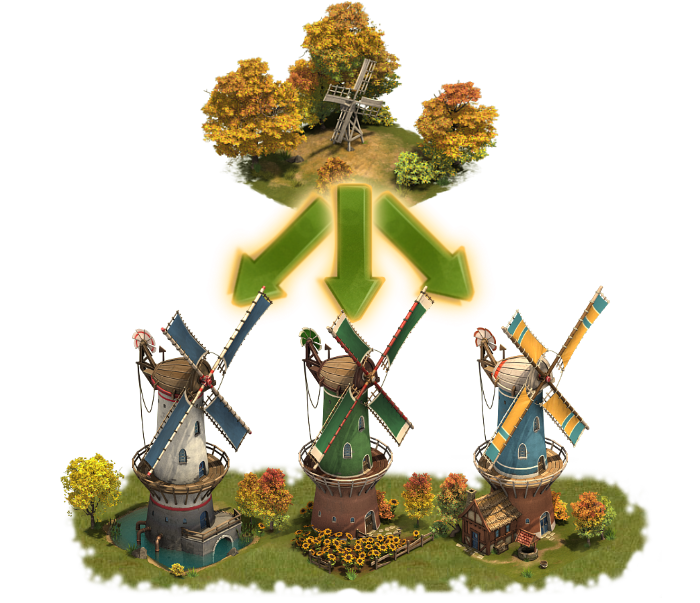 Naturally, in order to upgrade the Mill of Fall, you will need to use The Mill of Fall Upgrade Kits. In order to get as many as possible, advance through the questline and bake recipes! 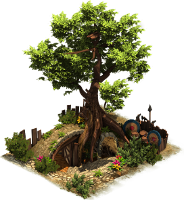 The newest available level of the Cider Mill is the Prosperous Cider Mill, and it became available already with the last game update. During the event, you'll get the chance to pick up some Cider Mill Upgrade kits to reach it! The Rogue Den has exactly the same values as a the original Rogue Hideout, but is smaller (2x2)! The only way to get it is by shrinking an existing Rogue Hideout with a Rogue Hideout Shrink Kit. The kit can be obtained as a Grand Prize Reward, and you will also find it among Daily Specials. And that's still not everything! As you could see in the video, when baking recipes, you will sometimes find a new kind of reward called "fragments". 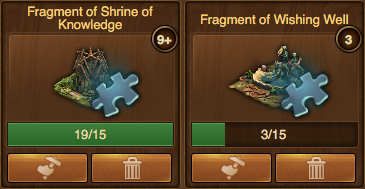 These will be fragments of two buildings: either the Shrine of Knowledge or the Wishing Well. Fragments are a new way of collecting rewards over time. We've seen how many players appreciate progress-based rewards in events, and have decided to introduce a new way of making progress towards some of the most desirable ones (as opposed to either getting one, or getting nothing). Collect 15 fragments of the same building, to combine them into the actual building to place in your city. Don't worry - you'll of course also still find Shrines of Knowledge and Wishing Wells in the usual places as Daily Specials and Grand Prizes. We hope you enjoy our new event! It will conclude on the 3rd of October. As always, your feedback is very important for us, so don't forget to comment here! 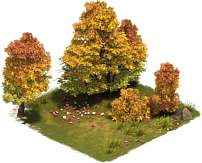 Thank you for playing Forge of Empires, and happy Fall! PS If you have any questions, you can ask the event creators directly! We will host a Q&A session that will take place on our International Facebook page and Instagram on Thursday (September 13th) at 5:30 PM CEST. See you there! Tvontkomin, WhiteGoldWelder, Amaris Oracle and 3 others like this.